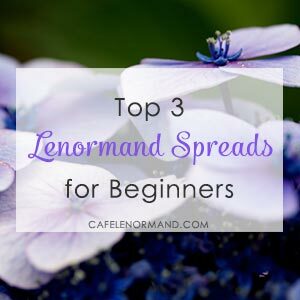 There are so many Lenormand spreads for beginners that it can feel daunting to know where to begin. Most Lenormand books include multiple spreads… You can find more spreads on Pinterest and on forums. But having so many spreads to choose from can be overwhelming and confusing if you’re a beginner. 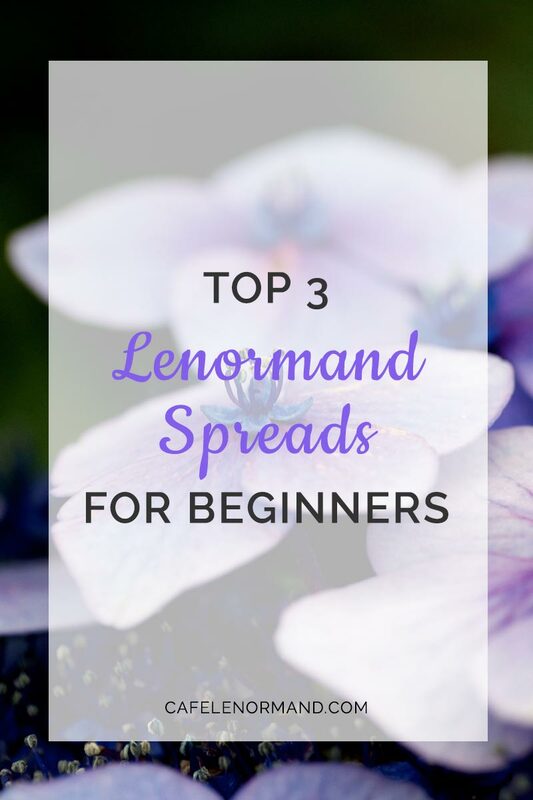 That’s why I want to share with you my top 3 Lenormand spreads for beginners. Most of them seem simple and straightforward, but that’s where the beauty of Lenormand lies. Even advanced Lenormand readers use simple spreads to gain deep insights and guidance. The name says it all. Do a spread each day. You can pull a single card to get guidance for your day ahead. You can ask, “What will happen during the day?” Or ask the Lenormand cards what you need to do to have an easy, joyful day. When you draw your card, make a note in your journal about which card you drew and what you think it is telling you. At the end of the day, compare your experiences to your notes from the morning. After you shuffle your cards, draw 3 cards and place them in front of you, left to right. Read the cards in the context of your question. They can reveal what has led you to where you are right now, and give insight into what will happen in the future. You can look at each card individually, and read them together to create a sentence. It is when you read them together that you will get a detailed picture of the events and situation you are asking about. The information you receive can help you know how to move forward. This is my favorite spread. I use it whenever I need insight into events or help dealing with frustrating situations. It also forms the basis for timing spreads and spreads where a yes/no answer required. It’s really an expanded version of the 3 card spread, but by using 5 cards, you gain more clarity and guidance about specific circumstances and any actions you should (or shouldn’t) take. Pull 5 cards and lay them in front of you, left to right. You can read each card individually, read the 5 cards together to form a sentence, and mirror cards (read card 1 with card 5, and card 2 with card 4). Each layer gives more meaning and insight to the reading.